Volunteers for 2017 Raptor Survey is NOW FULL! You are at:Home»Current Events»Volunteers for 2017 Raptor Survey is NOW FULL! To all who signed up to take part in this survey, we thank you and hope you will enjoy your role as a “citizen scientist” in Griffith Park. And to those who wished to take part, we’re appreciative of your efforts, unfortunately, we’re now full! Please keep checking back for other volunteer projects in this Park! Griffith Park, including the Los Angeles River channel, is home to about 150 regularly-occurring bird species. Intensive fieldwork following the May 2007 wildfire documented nearly 100 species in the park (exclusive of the L.A. River), including several species which are considered bird species of conservation concern in Los Angeles County. Of the several dozen nesting species in the park, at least seven are raptors, or birds of prey including hawks, owls and falcons. These species tend to use the same nests or nesting sites year after year, and are of high interest to both the public and to conservationists. Because they vary in their tolerance to disturbance, they are good indicators of ecosystem health. The most common nesting raptors are probably the Red-tailed Hawk and the Cooper’s Hawk, which favor tall pines, eucalyptus, and (in the case of Red-tails) tall structures such as transmission-line towers. Less common are Red-shouldered Hawk and American Kestrel (the Peregrine Falcon occurs uncommonly year-round, prefering to nest away from the park on tall buildings in more urbanized areas). Owls are particularly poorly-known, but Great Horned Owl, Western Screech Owl, and Barn Owl have been observed in the park year-found and all three likely nest. 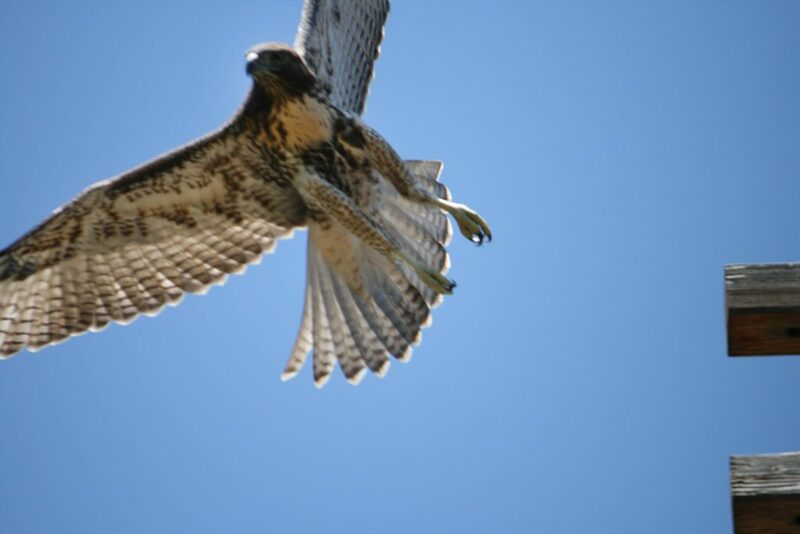 We propose to initiate a volunteer/“citizen-science” survey of nesting raptors in the park in 2017, modeled after successful surveys elsewhere in the region (including long-term monitoring of areas in Griffith Park). In concept, trained observers would locate most of the nests initially, and volunteers would make regular visits to the same nests throughout the season, taking note of nesting stage (building, incubating, food-carrying, etc. ), and determining nesting outcome (number of fledglings, estimating fledgling survival). Volunteers deployed to monitor nests; new nests continue to be located, and basic data taken on substrate/tree species, topography, etc. This Nesting Study will be conducted by Cooper Ecological Monitoring, Inc. and is part of the ongoing effort to document flora and fauna of America’s largest municipal park, which protects more than 4,000 acres of wildlife habitat. Since spring 2007, Cooper Ecological Monitoring, Inc. has worked with the Los Angeles Dept. of Recreation and Parks and other organizations to develop baseline inventories and species lists for the park.